10. I counted ten dancers stomping, spinning, shuffling, jumping, jigging, and jamming at the Meridian Hill Park Sunday Drum Circle. They may have been high...or just happy. (I like to think the latter.) A couple friends and I sat in the chilly (?!?) sunset, and people watched for an hour. This is the second time I've been to the drum circle - it's been happening every Sunday, spring, summer, and fall, for over 40 years. Everyone's just there having a good time - dancing, hula-hooping, cart-wheeling, or (like us) sitting and watching and letting the beat and energy of the crowd saturate the moment. (This blogger captured it well.) Do you like my pictures? 9. Hours I slept Friday night. 8. Hours I slept Saturday night. Oh man, good weekend! 7. Hours spent touring embassies on Saturday. We started at 10 am and toured until 5 pm. A solid day's work. 6. This weekend continued Embassy Month. The EU was on display, and my roommate and I started early. We hit up a total of six embassies: Germany (well that's a stretch. We saw the outside and decided that the line was too long to go in), France, Sweden, Spain, Finland, and Denmark. France had the best costumes with people dressed up Marie Antoinette style and a horse-drawn carriage to ride. Sweden wins for location. They're right on the Georgetown waterfront and have an awesome roof deck (the pictures are from the roof). Spain was pretty meh. Long line, some good snacks, but not much else. Denmark was cool from the outside. It's really secluded on an off-street of Massachusetts Avenue, but they wouldn't let us inside the embassy itself because we arrived too late. 5. Number of Chinese dishes LLC ordered (in Chinese - yep, get impressed) at Sichuan Pavilion for her graduation dinner. Eggplant. Yum. Spicy string beans. Yum. Chicken something something. Yum. Pork in tofu skin wrappers over spinach. Yum. Tofu in amazing sauce. Yummmmm. Her parents and sister were in town for her graduation, and it was the first time I've met them! Long lost family! Pretty crazy. They were exactly what I expected after a lifetime of hearing about my mama's older sister's family but never meeting them. 4. I watched four episodes of West Wing on Saturday alone. Addicting. Jed Bartlet is my president. 3. Pizzas the aforementioned roommate and I made for our second house Pizza Party. OMG these were epic. And yes, I feel completely comfortable throwing that term around. They're worthy of their own blog post, so get excited for that. 2. Scoops of free gelatto from the grand opening of a new place in Dupont. Dolcezza Artisanal Gelatto has been hooking up the sample-cruisers of the farmer's market for quite a while, but in celebration of their opening a new storefront, they gave away whole scoops! Until I win the lottery, this is probably the only time I will eat their gelatto. I tried Dulce de Leche gelatto, and Orange Cardamon Sorbet. YUM! 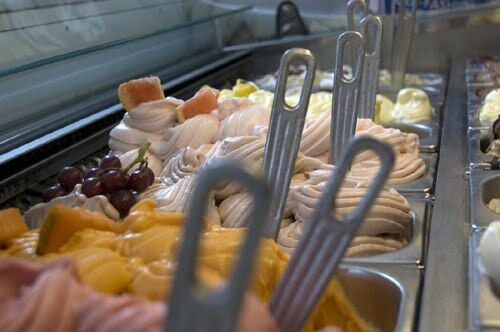 Gelatto is different from ice cream in that it contains half the fat and much less air. It is also served at a warmer temperature, so you can taste it better. Sorbet has no dairy and is mostly fruit. 1. Yoga class. Sunday afternoon, post-gelatto and pre-drum circle and pizza. Gotta get my yoga on.